These days, many students are skipping meals for several reasons. In fact, when The Post asked 250 students, “How many meals do you have a day?”, most students responded with an average of 2.06 meals per day. The reasons were diverse. They included diet, no time to eat due to oversleeping or consecutive lectures, being too tired and having financial problems. However, another reason is because people are thoughtlessly following trends. The trends are intermittent fasting with one-meal-a-day diet. It is not hard to find books, watch documentaries and see pictures of the trends. As its name implies, “one-meal-a-day diet” is having only one meal a day. Intermittent fasting is eating food on an empty stomach, which works by consuming no food for 16 hours straight . Some students see nothing wrong with this behavior and view this eating habit as a good diet plan. Other students argue that this trend can have bad effects on the body. The Post surveyed 200 students about the experience of intermittent fasting or the one meal a day diet for seven days from August 8th to the 15th, and 122 students said they had some experience and 78 students said they had no experience. There were two kinds of students who said they had experience. First, StudentA said she had no time to eat and did not like to eat alone so her one- meal-a-day diet began rather helplessly. She said “Because of my life style, I decided to try this trend. Then I do not have to worry about eating alone.” That was about three months ago and even now, she is still following the trend. StudentB, the second case, had diverse experiences with diet. She did not notice any adverse effects. She read Internet news about intermittent fasting. She said that one meal a day diet was too much for her, but intermittent fasting seemed like it would be possible. She is currently maintaining her diet well. While some students have had positive experiences, there were other students who started out positively but have ended up with bad results. The bad results included no effectiveness, loss of power, difficulties dealing with appetite, loss of concentration, and feeling on edge. There were mainly two kinds of cases. StudentC wanted to try a healthy diet. He had only one meal and tried not to overeat. However, after three weeks, he started to lose strength and began to notice it through such simple tasks of opening doors. “When I tried to open doors, I had to push much harder than before,” he said. After that, he stopped having one meal a day. StudentD also wanted to go on a diet and chose intermittent fasting. She tested the diet herself with an empty stomach for 16 hours a day, for a month. She did not notice any effectiveness. Hence, she stopped her intermittent fasting. These cases should raise questions to students, such as what this trend is, and what the problems associated with it are. The reasons why it has had problems or no effectiveness are diverse. This diet requires a long period of time with fasting. The stomach should be empty for 16 hours, and nutrition is needed. Likewise, the two trends are complicated and there are many things that could change per person. Intermittent fasting and one meal a day diet is a basic concept. When a person reduces 40 percent of a portion of a meal, while maintaining a hungry stomach for a certain time, the person’s life expectancy grows to one and a half times longer. Also, when a hungry stomach is maintained for at least 16 hours, sirtuin, a protein that is related to longevity genes, starts to form. Sirtuin has an aging effect and helps cells to stay healthy when the body gets stressful. So the level of immunity and natural healing power increases. Moreover, blood sugar and insulin decrease, and as the final outcome, weight also decreases. While this is the basic concept, there are differences between the two trends. The one meal a day diet burns toxins from the body and allows the body to purify by burning calories, but this meal must have enough nutrition. Intermittent fasting is similar to the one meal a day diet. The difference is how long the stomach would stay empty. There are two ways to do this. They are the rule of 5:2 and the rule of 16:8. 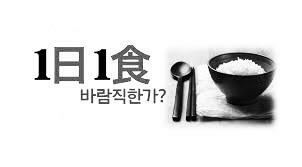 First, the rule of 5:2 is having three meals for five days and one or two meals for two days. The rule of 16:8 is staying 16 hours without eating and having two meals for eight hours. In addition, this rule has to be practiced at least three days in a week. What’s significant is that this has to be paralleled with exercise and maintained for six months. Many students who follow these trends are going about it the wrong way. As there are diverse mass media that deals with such trends thoughtlessly these days, students have to sort through it all and learn the right rules. Whatever trend they follow, students need to know the correct system and adjust their diets in an appropriate way, or else the results would be worse than doing nothing.